Specialized in the range of networked personal and embedded computer systems, Analytica GmbH, Karlsruhe, offers different CAN-Ethernet-Gateways that have already proven themselves in a large number of applications. 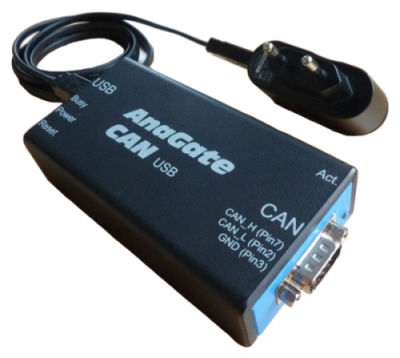 This product line was now extended: the AnaGate CAN USB can interconnect a personal computer with a CAN bus network via USB. Unlike other manufacturers, Analytica encloses the CAN telegrams in TCP/IP telegrams and the transmission is done via a virtual network card on the personal computer. This ensures compatibility with existing ethernet gateway models of Analytica. When necessary, a change from the entry model to one of the high-end models is easily possible. 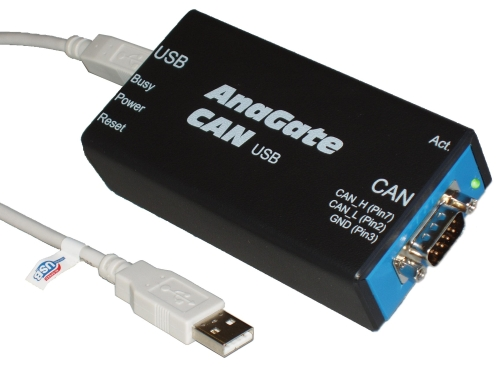 The AnaGate CAN USB is not only a network gateway, it is an embedded computer with 64 MB flash and 32 MB SDRAM memory, which runs a linux operating system with kernel 2.6. Customers can create individual software to extend the functionality of the device itself for their needs. On the one hand, this can be done via a proprietary disclosed TCP/IP based protocol or the included software API. On the other hand the robust, compact and stable scripting engine Lua is supported, which is especially dedicated for embedded systems. The Lua scripts can be executed directly on the gateway and are easily downloaded via the integrated web interface. Power-supplied with a standard USB charger, the AnaGate CAN USB can be operated stand-alone without personal computer and execute self-created Lua scripts for example. The field of application is limited only by the user’s power of imagination. So, the entry model provides many of the features of its big brothers at a significantly lower price.